Begin your wedding day with positivity and happiness. It’s your wedding day, exciting feelings and emotions are running high. It’s your day to look absolutely stunning and radiant and to feel confident. Your hair and makeup style will play a big role on your wedding day. The Anu Malhi team are here to make you look and feel beautiful to give you the perfect dream look. Feel calm and relaxed in our hands knowing that your chosen Artist will work with you on exploring your vision to give you a flawless bridal look. Our team pride themselves on providing the highest quality end to end service that will last you the entire wedding day. I trust Anu to the point that I let her choose what look she wanted to create for each of my events and I was pleased with how I looked for every single event. 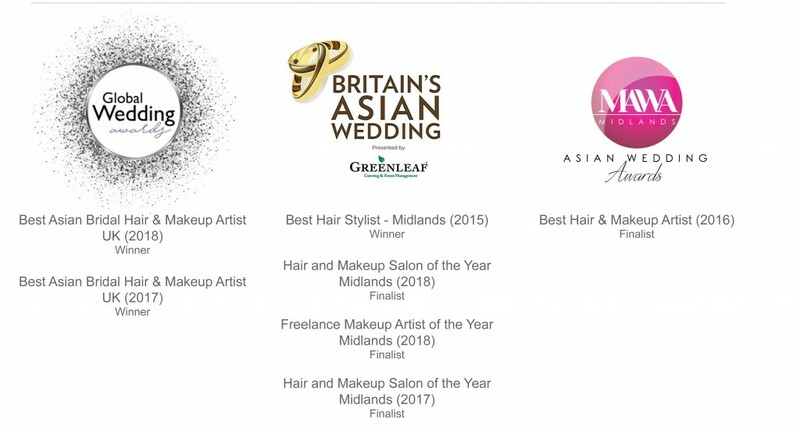 Each Artist on the Anu Malhi team has been trained to the highest standards and truly feel passionate about hair and makeup and love to work with clients on creating the perfect bridal look to suit their unique style. The only distinction between Artist levels is the number of years of experience (typically vary from 5 – 15 years). You deserve to look absolutely stunning, not just on your wedding day but also on your pre wedding ceremonies including Engagement, Civil, Chunni, Sangeet or your Mehndi night. Feel relaxed in our safe professional hands to make you feel at ease and create your perfect hair and makeup look for your special occasion. We travel internationally, however, the primary areas our team covers is the West Midlands, Birmingham, Wolverhampton, Leicester, Walsall, Dudley, Leamington Spa, West Bromwich & Coventry. You’ve had your big day, but that doesn’t mean you can’t look absolutely stunning on your post wedding day ceremonies such as the Reception or Next Day. Feel relaxed in our safe professional hands, where your chosen Artist MUA will make you feel at ease and create the perfect hair and makeup look for your special Asian Indian occasion. To book your consultation with the Anu Malhi Team please read the ‘Trial Consultation’ section below. Having a trial consultation can be one of the most important wedding preparations you can do in the run up to your Wedding Day. In advance of attending the Trial Consultation you could browse though our portfolio galleries for some ideas / inspiration. Primary areas covered are the West Midlands, Birmingham, Wolverhampton, Leicester, Walsall, Dudley, Leamington Spa, West Bromwich & Coventry. Our team also cover London and greater London areas for Asian Bridal Hair and Makeup.